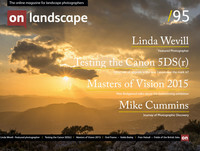 Linda is a landscape photographer based in Devon. She considers that in photography the camera is just a tool and how the changing light is chosen reflects the photographer’s vision and what they are trying to communicate. Linda aims to capture the essence of a place and to portray the colour, texture, shape, form and vitality of the scene before her. I’ve mentioned before that the camera takes on a journey. Sometime this starts early in life, sometimes later on, as in Linda Wevill’s case. Over time our image making evolves and often becomes more personal - once we are freed from the concerns of equipment and technique, we are able to concentrate on the image itself. And with growing confidence comes a new found freedom to experiment and to express ourselves through our image making. This comes through both in Linda’s images, and in the way that she talks about her development as a photographer. I cannot remember being particularly encouraged to take photos when I was a child, although the family always took the usual snapshots of our days out and holidays. What I do remember though, is being quite passionate about the beautiful natural world around me. I went camping quite often and can visualise sitting by the tent in the countryside mesmerised at the beautiful and peaceful scene in front of me. I took an Economics degree at university and then a PGCE in Economics and Business Studies so it was not until later in my life that I was able to combine my passion for the landscape with my ability to express this feeling in my photographs. I believe that you have your daughter to thank for your interest in photography. When and where did your relationship with the camera start, and what subjects and styles appealed to you at the time? My youngest daughter was studying for A Level Photography in London and I really enjoyed going around the galleries to see the photographic exhibitions with her. I quite often helped her with some of her photographic projects – I remember dressing up as a witch for her to photograph on one occasion – luckily I had a withered mask, so no one could see it was me! At that time I really loved mono images and I started by using black and white film and set up my own darkroom. Although in the beginning I took a variety of subject matter, including portraits, living in London I was particularly attracted to the street scenes with long shadows. I took photos of whatever was happening around me; I remember photographing the Countryside Alliance march and found it very exciting. We saw an Intensive Weekend Photographic Course advertised and my daughter suggested I booked myself in for it. I borrowed her camera and it was the first time I had used an SLR. I just enjoy being out there and soaking in the beauty and it always amazes me that I can see magical scenes when the light is wonderful that might only last for about ten minutes. The course involved taking photos and then processing them in the dark room. I absolutely loved it and the rest is history - I have been passionate about photography ever since. How did moving to Devon change things? On moving to Devon, I soon wanted to be able to take photos which showed the wonderful colour of the local scenery. It was also the time that digital cameras were becoming more reasonably priced, so I changed to digital and then had the choice of colour or mono for my images. Why do you love (landscape) photography? I love landscape photography because it enables me to combine my love of the countryside with my love of photography. It gives me a reason to get up before sunrise and to stay out until after dark. I just enjoy being out there and soaking in the beauty and it always amazes me that I can see magical scenes when the light is wonderful that might only last for about ten minutes. On my way back home when the sun has risen and the mist burnt off, or the frost has melted and we are back to normality, I realise that some people are still in bed and will never experience the wonderful sights I have just seen! You’re very much involved with the Royal Photographic Society, and have considerable competition experience. How have these influenced your development? I joined the Royal Photographic Society quite early on. I did a photographic course at Central St Martins and my tutor there suggested I join to give me a way to move forward. I always enjoy a challenge and working towards the society’s distinctions is a way to make you work hard to improve your photography. It is also very satisfying when you gain a distinction as you really feel you have achieved something. The RPS distinctions are gained by producing a panel of images that fit together so for my Associateship I needed 15 images and I worked on a panel of local landscapes/seascapes. It took me about 3 years to achieve this level as my images were improving all the time, so as I was progressing some of my earlier work looked out of place with my better later work. This spurred me on to keep going so that I ended up with a panel with all the images as good as each other. I also enter images for International exhibitions/salons and work for the FIAP (Federation of Photographic Art) distinctions. Rather than working in panels, these images need instant impact and the initial rounds are marked quite quickly by the judges. Here again, I use the exhibitions to get feedback on my images, but also to keep me working hard at improving my photography. I always bear in mind, however, that judging photos is a very subjective process, and one image may gain an award in one salon and be rejected in the next. After gaining my Associateship of the RPS, I spent a couple of years entering the international salons. I then reached the point where I could see that my photography had improved and this then gave me the confidence to start working towards my Fellowship. Congratulations on achieving your FRPS – Fellowship of the Royal Photographic Society. Your Panel combined two loves - sailing and photography? I must admit, I was absolutely delighted to have gained my FRPS in May last year. I was floating in the clouds for quite some time as it had been an ambition of mine for several years. Once I decided I had reached the level in my photography where I could probably start working for my Fellowship, I then had to decide on the topic and this took quite a while. I had been working on coastal work for a joint exhibition entitled ‘Spirit of the Coast’. Sometimes I liked to capture the lines in the water and often I used the 10 stop filter to smooth out the sea and to reduce the image to its basic composition. However, I did not think I would gain my FRPS with a panel of seascapes unless I came up with an unusual slant. Although the F panel does not now have to be original, you would certainly not achieve it with a topic that had been seen many times before. The main advice I received was to ‘follow your passion’. I thought about this and my passion was obviously landscapes/seascapes, but then I thought of another aspect of my life – sailing. This then gave me the topic for my panel and, as I had also been experimenting with texture layers in Photoshop, I was able to combine the two passions into one image. I made the objects used to secure a boat to the shoreline, i.e. the pulleys, hooks, rings and so on, the subjects of my photographs and combined these with images of rough sea in Photoshop. I changed the opacity of the sea layer and brought the subjects through softly so as to give a painterly effect. After a period of time I realised I had the required number of images that were varied enough to put together as my panel. Tell us a little about the Visual Art Group. The RPS is an organisation that covers all aspects of photography and the Visual Art Group is one of the Special Interest Groups which are formed in order for people to meet other like-minded photographers. The subject matter for the Visual Art Group is quite broad but the aim is for photographers to have a personal vision or style in their images which convey emotion and mood and encourage the viewer to look beyond the subject. The group has its own magazine and a members’ annual exhibition, as well as organising a couple of weekends away each year. I am on the committee of the national Visual Art Group and I also organise the South West sub-group. In the South West we organise days with speakers and have members’ days where about 30 or so photographers meet up and show each other our recent work. We usually see some excellent photography on display and it is an opportunity to get feedback on our images from our colleagues. The photographers that inspire me obviously change over time as my own photography develops. When I first started photography I really liked the classical black and white street scene images of Henri Cartier Bresson, Ansel Adams and Robert Doisneau. At the time I also took portraits and I went to an exhibition at the National Portrait Gallery of the work of Julia Margaret Cameron, which I found fascinating. I came across the work of Tom Stoddart in a gallery in Dublin and purchased his book ‘iwitness’. I found his work really powerful although pretty depressing, but that was what he wanted to achieve. His photojournalistic images allowed the world to see the outcomes of world disasters; the emotion and misery came across in all his images. Although this was not the type of photography I wanted to pursue, his work showed how photography could play a very important role and he was certainly an inspiration for me. As I started to change to taking more colour images, especially in the landscape, I looked to the work of Joe Cornish for inspiration. I really liked his images with rocks in the foreground leading the viewer into the image. I have read since that he does not like being known for just this type of work, but it certainly inspired me at the time. This is a difficult question. I suppose the one that stands out for me at the moment was when the topic for my F panel became clear; that I could combine my passions of sailing and my love of taking coastal images and produce the images for my panel. I had gone through a couple of other ideas that had not worked out when I tried them, but this idea, I knew I could proceed with. I have been using the Canon 5D Mk II for a few years now and am completely happy with it, although I would change if a Canon seawater proof one came on to the scene at a reasonable price. I have had to spend quite a bit of money on renewing the electronics in my camera after being splashed by seawater! I have just bought a Gitzo Ocean Tripod so, hopefully, this will last me longer than my previous ones! I use the Canon L series lenses, and I have the 24-105mm, which I use most of the time. I also have the 16-35mm and 70-300mm lenses. I tend to take all three of these lenses out with me, unless I am travelling abroad, when I tend to miss out the 16-35mm. You’ve said that you don’t really think of yourself as creative, yet you like to experiment both in terms of technique and in processing and combining images? As I was growing up I never thought of myself as creative – after all, the only school exam I failed was ‘Art’! Mind you, this was drawing and I am sure I would fail that today! I realise now that different people have different ways of bringing out their creativity and I feel I have now found my means of expression as I have progressed with my photography. I do really enjoy experimenting with photography, both in camera, using different shutter speeds, moving the camera and so on, and also in Photoshop, where I enjoy using texture layers and combining images to see the effect that can be achieved. I enjoy not just recording reality but getting beyond this to capture the atmosphere and mood of a landscape and I use Photoshop as a tool to bring out the mood that I am trying to portray. I always use my own photographs as texture layers and I have quite a large file of textures, most of which I will never use, but when I need one, I certainly have a choice. With my general landscapes I try not to do too much work in Photoshop. I always take RAW files and do basic adjustments using Adobe Camera Raw. I then tidy up, if necessary, in Photoshop, sometimes opening different exposures and combining the images, if they have quite high contrast. With my images where I use texture layers, I combine the two images, putting the texture on top of the image and changing the opacity. I then add a layer mask and bring through the parts I want from the original image. This is a bit of trial and error to see what looks right. It is very easy to go over the top with this type of image and I like my images to be quite soft and painterly. I sometimes add a white layer to give a pastel effect to my images. You do your own printing and have a particular love of fine art and textured papers. Tell us a little about how you print your images and how important the choice of paper is. I have always done my own printing from my darkroom days and then when I went ‘digital’. I spend a lot of time making sure my image is printed how I want it to be viewed and I have complete control over this when I print myself. I much prefer this to seeing my images projected or seen on a computer screen where you are never quite sure how they will look. I love the fine art papers around now and I find different types of images look better on different papers. Mono work is fine on a semi-gloss paper, whereas I like the matt textured papers for my pastel and textured work. In fact, I often use a parchment paper, which really brings out the textures. I currently have an Epson Stylus Photo R2880 which I have been very happy with, although when I buy my next printer, I would buy one that does prints to A2 size as I find I sometimes need images of this size when I exhibit my work. Tell me what your favourite two or three photographs are and a little bit about each. I really like this image as I love the soft pastel colour of the sky reflecting in the sea and, with a shutter speed of 5 seconds, the water has been captured flowing gently over the rocks. It had been a misty day and the sun came out for about ten minutes to enable me to capture this shot. I like this image as it is near to home and the frosty misty scene was quite magical. It is quite unusual to have this beautiful colour on the river as it is north facing so does not often have the sunrise or sunset colours reflected in the water. To capture sharp boats on mooring buoys, you need a fast shutter speed and this can be quite difficult at this time of the day. This image was taken at sunset which coincided with a high tide flowing over the edge of the pool. The long shutter speed of about 40 seconds gives the image an ethereal, moody feel. The sea water is smoothed over making the composition simpler and reducing the scene to its elemental shapes. I like the softness created in the foreground as the water flows over the boating pool and yet the marker buoys in the distance are much sharper. The gentle colours of the sky reflecting in the sea gives the scene a tranquil quality and this is what I wanted to portray in my image. This obviously changes as you progress, and I have been proud to have work accepted into the London Salon, the RPS International Print exhibitions and the Landscape Photographer of the Year over the last couple of years, but at present I am still most proud of gaining my Fellowship of the RPS. I am working on this one!! Over the past year since gaining my Fellowship I have enjoyed the freedom to take whatever images I have wanted at the time and enjoyed experimenting with different techniques. I have taken a variety, and have a few small projects on the go, but I am always looking for new ideas. A future challenge would be to have an exhibition on my own and maybe to produce a book to accompany the exhibition. I might well go off on a sailing trip, maybe go across the Channel to France or along the Devon and Cornwall coastline. I love mooring up in a different harbour and going ashore for a nice meal or just sitting on the boat watching the boating world go by. I also enjoy going for walks with our dogs, either coastal walks or on Dartmoor, but even if I don’t have a camera with me, I am sure I would be doing reccies for another day. When I am not out and about, I really enjoy reading novels, but rarely have the time in my daily life, so I might just curl up with a book! Which photographer or photographers do you think we should interview for a future feature? I am sure your readers would be interested in seeing the work of Paul Mitchell*. Paul has recently gained his Fellowship with a panel of coastal scenes taken with a pinhole camera. I saw Paul talking about his work and it is absolutely fascinating – really back to basics! I have a friend who lives locally and I think he is a very good photographer - his name is Mike Longhurst . Thank you, Linda, for sharing this with us. If you’d like to see more of Linda’s photography you can visit her website. this includes a number of new images that she has been working on. Linda has recently stepped down from the RPS Visual Art Group national committee but she still organises the South West Visual Arts Group.